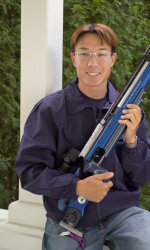 MUNICH, Germany  Ryan Tanoue, who just finished his eligibility at the University of Nevada this spring, won the air rifle International Shooting Sports Federation (ISSF) World Cup Championship here Sunday by a tenth of a point for the United States. The Honolulu native went into the finals tied with three other competitors that involved more than 120 shooters from around the world. Tanoues final score was 102.5 to 102.4 for Romanias Alin George Moldoveanu, which came down to the final shot as to who would win the competition. I am very glad to have won that medal as well as the quota place for Beijing, Tanoue said after the competition on the ISSFs website. The win secures the United States a quota slot at the 2008 Beijing Olympics. 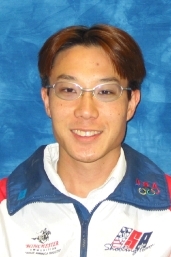 Tanoue will still have to qualify as an individual in the spring of 2008 for the U.S. Olympic team. Tanoue has international experience, having taken the 2002 junior bronze medal at the 2002 World Cup in Lathi, Finland, but this is his first victory on the international stage. The 22-year-old Tanoue will graduate in December with a degree in Psychology. He won the 2002 NCAA air rifle championship as a freshman and was an All-America selection all four years, including this past season when he was awarded All-America status in both air and small bore. He helped Nevada advance to the NCAA Championships each of his four years, including a team runnerup finish in 2004. It is a great feeling to win his first Gold medal and adding a Quota Place for the next Games  Ryan Tanoue from the United States of America says after winning the 10m Air Rifle Men Final. The neck on neck race for the Gold medal in the 10m Air Rifle Men Final was decided with the last shot in favour of Ryan Tanoue,22, from USA, who scored one tenth of a point better than Alin George Moldoveanu, 22 from Romania. The Bronze medal went to Lim Young Sueb, 31, from Korea. MURRAY, Ky.  Nevada junior Ryan Tanoue (Honolulu, Hawaii) picked up All-America honors again Friday during the individual portion of the NCAA Rifle Championships here. The 2002 air rifle NCAA Champion tied for third with a 395, along with Jamie Beyerle of defending team champion Alaska-Fairbanks. The two were one point from second place and three from the NCAA Champion, Morgan Hicks of host school Murray State. Tanoue earned All-America stats in both air and small bore last year as a sophomore. Holly Caraway and Matthew Briggs of Nevada also competed in the individual air rifle meet and shot 383 and 378, respectively. Additionally, Tanoue was 11th in small bore with a score of 1163, earning All-America status in that discipline, as well (the top 12 earn All-America honors). Nevada will be one of eight teams competing in both air and small bore Saturday in the team portion of the two-day meet. Alaska-Fairbanks is the five-time defending NCAA Champion in both disciplines but should get contention from host Murray State and Nevada.